What's this winter's financial forecast? Storm clouds on the horizon with a distinct chill in the air for at least the near term. The Fed's purchase of mortgage-backed securities has made the news, but recession-related headlines continue to stir angst among consumers. What does it all mean? John A. Tatom, director of research for the Networks Financial Institute of Indiana State University's Scott College of Business, discusses activities of the Federal Open Market Committee, the recession, how the Fed can jump-start the economy and what else needs to happen to improve our fiscal forecast. Indiana State University is seeking applications from high school seniors for the Networks Scholarship program. Recipients of the Networks Scholarship, which includes a four-year, full in-state tuition scholarship, along with a $3,000 professional development account and a laptop computer, also participate in the Networks Professional Development Program. The program, offered by Networks Financial Institute in ISU's Scott College of Business, provides selected students an award-winning, four-year curriculum designed to cultivate leadership, management, teamwork and career skills. Students also receive access to internships and international travel opportunities. Through various programs and events, Networks Scholars also meet and develop professional relationships with corporate mentors, faculty and alumni. Educators will visit Indiana State University to learn more about financial literacy education for students. The "Financial Literacy Workshop for Educators" is part of a series of events across the state by the Indiana Jump$tart Coalition, a nonprofit organization that works to improve the personal financial capabilities of children, youth and adults in Indiana. The workshop, which will run from 5 to 7 p.m. Nov. 1 in ISU's Bayh College of Education, is open to all educators and pre-service teachers who incorporate financial education into their teaching. Registration is required. "We have such a beautiful college in the Bayh College of Education," said Priscilla Wolfe, director of education for Networks Financial Institute in the Scott College of Business at ISU. NFI is co-sponsoring the event. "We hope to give them a positive learning and networking experience when they come to campus." Finance For Teens – Should Financial Education be Taught in Schools? I will be the first to tell you that when I was in high school, I had very little interest in learning about money management. That said, I certainly had an interest in money. When I turned fifteen, old enough to get a work permit, I got a job at a local pet shop. Like most teens I was excited to have extra money to spend, but fortunately my parents curbed my spending habits the good old fashion way…bribery. This was the deal: If I wanted a car when I turned 16, I had to save for it. Every dollar I saved, they would match towards the purchase. Very quickly, I began saving almost every penny I made, and by the time I was 16, I had saved $3,000. (Keep in mind minimum wage was $3.75 an hour) While the promise of something in the future, my first car, was enough to motivate me to save, I had no knowledge of compound interest or other long-term saving principals, nor did I have any idea of how a car loan or credit card worked. It wasn’t until later in life that I learned from experience how these important principals. Health care industry representatives, scholars and analysts will discuss health care reform during an Oct. 21 conference at the Columbia Club in downtown Indianapolis. Wayne DeVeydt, executive vice president and chief financial officer of WellPoint, Inc., and several panels will discuss "The Affordable Care Act: Challenges to Access, Affordability and Availability." Other participants include Scott Harrington, a health care systems and insurance and risk management professor in the University of Pennsylvania's Wharton School; William Hoagland, vice president for public policy and government affairs at CIGNA; and Daniel F. Evans, Jr., president and CEO of Indiana University Health, among others. They will discuss how the Patient Protection and Affordable Care Act will affect employers, insurers, state governments and health care providers. Networks Financial Institute (NFI) in the Scott College of Business at Indiana State University is sponsoring the conference. A prominent health care analyst and scholar will discuss insurance reform during an October 20 presentation at Indiana State University. Scott Harrington, a health care systems and insurance and risk management professor in the University of Pennsylvania's Wharton School, will speak about the Patient Protection and Affordable Care Act. His presentation is scheduled from 5 to 6 p.m. in the University Hall Theater, with a reception at 4:30 p.m.
Harrington will discuss the main issues affecting health care delivery and health insurance plans in the U.S., how the recently passed law will influence those issues and possible implications of the law's constitutionality. His presentation, which is free and open to the public, is sponsored by Networks Financial Institute (NFI) in the Scott College of Business at ISU. Federal regulation of life insurance and annuities is one step closer with the release of a report recommending that Washington seize some of the states’ authority. The Dodd-Frank Act mandated that the Federal Insurance Office (FIO) deliver a study to Congress on the state insurance regulatory regime and recommend to legislators whether federal intrusion into insurance regulation is warranted. A Report to the Federal Insurance Office, released earlier this month, offers detailed recommendations on all six of the mandatory areas that the FIO’s report must cover and considers another seven optional items. Indiana State University’s Networks Financial Institute (NFI) released the paper well in advance of the FIO report’s January 31, 2012 due date, giving the FIO to subsume the paper’s recommendations. NFI: Federal Regulation of Annuities "Conceivable"
A federal regulator could eventually become the principal regulator for life and annuities or reinsurance or monoline bond carriers, according to a report released today by Networks Financial Institute (NFI). It is "conceivable" that this could happen while states continue to regulate health, property and casualty insurance, the 60-page document says. In fact, the federal office should consider whether particular products should remain under state purview, according to the report. NFI, a researcher and think tank at Indiana State University, Terre Haute, Ind., is delivering the report to the Federal Insurance Office today. Though Sandeep Gopalan taught Indiana State University students in a classroom a continent away from their Terre Haute campus, it wasn't his first time teaching them. Back in the U.S., he shared a building with them. Gopalan, head of the department of law at the National University of Ireland, Maynooth, is a visiting scholar in the Scott College of Business at ISU. During his visit in the 2010-2011 academic year, sponsored by the college's Networks Financial Institute, Gopalan worked with ISU professors and students to create different projects to teach students. The projects ranged from a role-play simulation for research to a three-week travel experience earlier this summer where students learned about international business - in Europe. 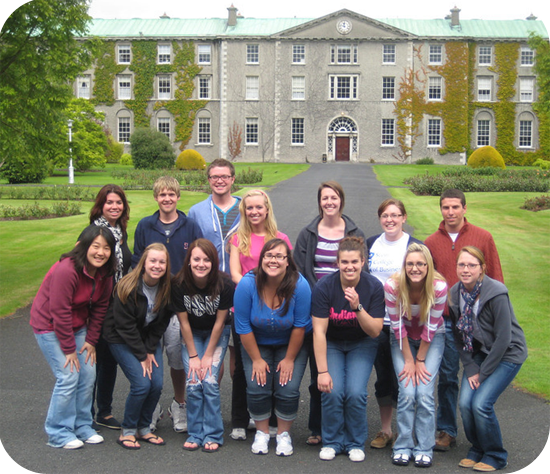 The group of Indiana State University students who traveled to Ireland pose in front of their dormitory where they stayed at the National University of Ireland, Maynooth. 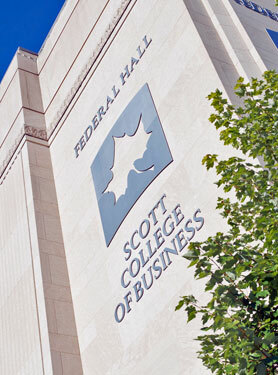 Indiana State University looks forward to welcoming fifteen high-achieving scholars to the Scott College of Business this fall. These students are recipients of the Networks Scholarship award, a competitive award for incoming freshmen. The honor comes with four years paid tuition, a $3,000 professional development account, a corporate mentor and the opportunity to be part of the Networks Professional Development Program. According to Terrie Troxel, executive director of the Networks Financial Institute (NFI), the goal of the development program is to "encourage talented individuals to study business and applied economics in preparation for professional careers in financial services. Emphasis is placed on development of leadership skills, ethical decision making, and effective communication both orally and in writing." Seven positions are being eliminated at Indiana State University, with all but two tied to a reduction in private or state grants, Tara S. Singer, assistant vice president of communications and marketing at Indiana State University, said Friday. Grant-funded positions to be eliminated include three positions in Indianapolis with Networks Financial Institute, effective June 30, and two correctional education coordinator positions funded through the state Corrections Education Program, Singer said. A conference at Indiana State University featured researchers presenting their award-winning papers about "emerging critical issues that affect financial services regulation," a conference official said. The presenters, who received funding from Networks Financial Institute, spoke at the Financial Services Policy Reform Conference at ISU on May 16. NFI, an institute in the Scott College of Business at Indiana State, awarded funding to the presenters through two programs. The recipients presented their research findings, which was followed by discussion among policy experts and scholars in attendance. 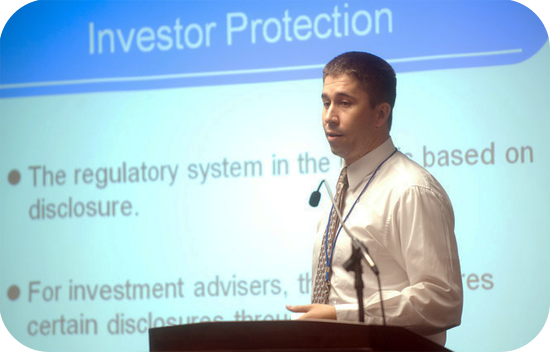 William C. Gerken, assistant professor of finance at Auburn University, presented his paper, "Predicting Fraud by Investment Managers," which he co-wrote with Stephen G. Dimmock, at the Financial Services Policy Reform Conference at Indiana State University on May 16. Gerken's research paper won first place in a competition from Networks Financial Institute, an institute within the Scott College of Business at ISU. Faculty and staff will have an opportunity to learn more about this year's highlights and achievements from students in the Networks Professional Development Program. The seventh annual Year-End Review and Scholar Recognition Program will be today at 5:45 p.m. in Dede I of the Hulman Memorial Student Union. The event will showcase the work done by students in the Networks Professional Development Program, a four-year comprehensive curriculum with focused activities designed to cultivate professional and leadership skills of ISU students. The award-winning program is part of the Networks Financial Institute in the Scott College of Business at ISU. Parents thoughtfully prepare for those important conversations with their children — the-birds-and-the-bees talk or the lecture on the dangers of drugs and alcohol, for example — but when it comes to discussing money matters, many find themselves tongue-tied. Research conducted by Indiana State University’s Networks Financial Institute found that despite the pervasiveness of spending in our society, the majority of parents do not feel comfortable with their knowledge of personal finance. And while middle and high schools are increasingly requiring personal finance to be covered in their curriculum standards, experts say that the time to teach youth the financial facts of life should be much earlier. The inaugural issue of a new research publication from the Scott College of Business at Indiana State University focuses on current topics in financial regulation. The first edition of "Research@Scott" covers financial services and public policy and features articles from national research fellows of Networks Financial Institute and the Scott College's own faculty members. The publication includes articles analyzing the current environment of the financial services industry - insurance, banking and investments. The lead article is written by James A. Leach, chairman of the National Endowment of the Humanities and a former member of the U.S. House of Representatives. Former Representative Leach is co-author of the Gramm-Leach-Bliley Act, also known as the Financial Services Modernization Act of 1999 that allowed commercial banks, investment banks, securities firms and insurance companies to consolidate. "In this particular issue, readers will get a sense of the impact of regulatory reform in the area of finance," said Terrie Troxel, executive director of NFI, an institute in the Scott College of Business. "The articles touch on different elements of reform." Financial industry experts will explain Islamic principles in financial services and investments during an upcoming workshop in Chicago. The Islamic Finance Workshop will take place on April 7-8 at the Sheraton Chicago Hotel and Towers. The conference, sponsored by Networks Financial Institute in the Scott College of Business at Indiana State University, will feature several speakers explaining investment, insurance and banking principles based on Islamic law. People attending the conference will have the opportunity to learn about the principles of Islamic finance, the size of the market and products and procedures that are involved, along with the advantages and disadvantages of utilizing these products, said John Tatom, director of research at NFI. "The idea is that there are financial market professionals who don’t know much about this part of the market and who would like an opportunity to learn more," Tatom said, "and they might be interested in developing their own opportunities in the market for mutual funds or other investment, insurance or banking products." Baker & Daniels LLP and B&D Consulting were pleased to support the 7th Annual Insurance Reform Summit presented by Networks Financial Institute in Washington, D.C., on March 16, 2011. This year's Summit focused largely on the Dodd-Frank Wall Street Reform and Consumer Protection Act passed in 2010, with particular attention given to the Federal Insurance Office and its looming report to Congress on the modernization of insurance regulation. A day after the Summit, Treasury Secretary Timothy Geithner announced that Illinois Insurance Director Michael McRaith will be the new Director of FIO. Participants in this year's NFI Summit included leadership of the Senate Banking and House Financial Services Committees Sen. Jack Reed (D-RI) and Rep. Judy Biggert (R-IL), National Association of Insurance Commissioners President and Iowa Insurance Commissioner Susan Voss, NAIC representative on the Financial Stability Oversight Council and Missouri Insurance Director John Huff, Professor Scott Harrington of the Wharton School at the University of Pennsylvania, the American Enterprise Institute's Peter Wallison, Governor Dirk Kempthorne, President of the American Council of Life Insurers, and American Insurance Association President Leigh Ann Pusey. The chairwoman of the House Financial Services subcommittee on insurance and a senior member of the Senate Banking Committee who chairs its subcommittee on insurance will serve as keynote speakers for an insurance summit examining the impact of the Dodd-Frank Wall Street Reform and Consumer Protection Act, with a focus on the forthcoming report to Congress by the newly established Federal Insurance Office. Rep. Judy Biggert (R-Ill.), chairwoman of the Subcommittee on Insurance, Housing and Community Opportunity of the House Financial Services Committee, and Sen. Jack Reed (D-R.I.), chairman of the Subcommittee on Securities, Insurance and Investment, will be among the speakers at a March 16 event in Washington, D.C. Networks Financial Institute at Indiana State University presents "In the Eye of the Hurricane: Preparing for the Federal Insurance Office and 2012 Report to Congress." In addition to Biggert and Reed, the 7th Annual NFI Insurance Reform Summit will feature remarks and presentations by many of the biggest names in the insurance industry and academia providing insight about what to expect as elements of the Dodd-Frank Act continue to be implemented. The chairwoman of a House subcommittee on insurance and a member of the Senate Banking Committee will headline an insurance industry summit examining the effects of the Dodd-Frank Act. Rep. Judy Biggert, R-Ill., chair of the Subcommittee on Insurance, Housing and Community Opportunity of the House Financial Services Committee, and Sen. Jack Reed, D-R.I., chair of the Subcommittee on Securities, Insurance and Investment, will be among the speakers at the seventh annual Insurance Reform Summit sponsored by Networks Financial Institute at Indiana State University. In addition to Biggert and Reed, the event will feature speeches and panels by many of the biggest names in the insurance industry and academia providing insight about the impact of the Dodd-Frank Wall Street Reform and Consumer Protection Act, particularly the forthcoming report to Congress by the new Federal Insurance Office. "Perhaps we are in a temporary quiet between the storm walls," said Terrie Troxel, executive director of NFI. "There was great debate surrounding the law's purpose and scope. Since its enactment last year, of course, the political landscape has changed, especially in the House of Representatives. We will see which way the winds now blow as we move into the future of studies by the FIO and more discussion in Congress about the next steps." A highly regarded banking regulation expert will discuss regulation of bankers' pay during a Feb. 22 event at Indiana State University. David VanHoose, a senior fellow at Networks Financial Institute (NFI) in the Scott College of Business at ISU, will present "Regulating Bankers' Pay: Is It Fair?" 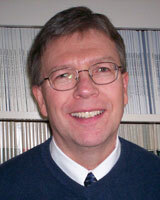 A reception will be at 4 p.m. on Feb. 22, with VanHoose's presentation scheduled for 4:30 p.m. The event will be held in Hulman Memorial Student Union, DEDE II at ISU. In his presentation, VanHoose will survey evidence regarding the relationship between bank management compensation and risk. He will also discuss the arguments for proposed and actual regulations of bankers' pay, along with the pitfalls associated with such regulations. Develop future financial services industry leaders. Improve financial services industry decision making, innovation, and progress. Improve financial literacy and decision making of current and future consumers. With innovative programs and services, NFI provides an unprecedented link among educators, students, professionals, policy-makers and citizens. Launched in 2003 as an outreach of the Scott College of Business at Indiana State University, NFI is made possible through a generous grant from Lilly Endowment Inc., an Indianapolis-based, private philanthropic foundation. Networks Financial Institute is a not-for-profit organization. It is headquartered on the campus of Indiana State University in Terre Haute, IN, with additional offices in Indianapolis, IN and Washington, D.C.
A research paper about detecting investment fraud has won a nationwide contest conducted by Networks Financial Institute (NFI) in the Scott College of Business at Indiana State University. William Gerken, assistant professor of finance at Auburn University, won first place in the National Competition for Research Papers on Financial Services Policy Reform. Gerken received top honors for "Finding Bernie Madoff: Detecting Fraud by Investment Managers," co-authored with William Dimmock. In their paper, Gerken and Dimmock provide strong evidence of the potential for predicting fraud before it happens, said John Tatom, director of research for NFI. A prominent financial expert affiliated with Indiana State University will deliver the keynote speech at the 2011 Indiana Leadership Economic Forum on Jan. 20. R. Christopher Whalen, a research fellow with Networks Financial Institute (NFI) in the Scott College of Business at ISU, will speak at the event taking place at Barnes & Thornburg in Indianapolis from 5:30 to 8 p.m. He will discuss issues from his new book, "Inflated: How Money and Debt Built the American Dream," and will describe some changes to monetary, fiscal and trade policy that he believes would help restore balance to the world economy. The event is being held by the Indiana Leadership Forum, an organization dedicated to attracting individuals to public service and promoting participation in the political process. Networks Financial Institute (NFI) at Indiana State University has awarded two professors in the university's Scott College of Business $30,000 each for their research projects. NFI awarded the grants to Lakshmi Balasubramanyan, assistant professor of finance, and Aruna Chandra, professor of management at ISU. Both professors are working on separate projects currently underway, said John Tatom, director of research for NFI, an outreach of the Scott College. The projects were chosen among five submissions. "These projects were the most developed, had the most promise of publishable results and were judged to contribute significantly to their respective fields," Tatom said. For many young adults, bad decisions about their finances can have disastrous results that can have serious impacts, sometimes lasting the rest of their lives. The problem lies in the failure to fully educate them about their financial lives. We live in a world where financial products have become both more complex and more available, meaning that consumers are facing more choices but have little education on how to choose what is best for them. Schools forced by cramped time and budgets to prioritize for other subjects are still lagging in preparing students entering the working world. And parents are not confident about their own financial literacy and therefore less likely to discuss financial issues with their children. Wouldn’t it be nice if all Americans were more financially literate? We’d make better financial decisions, have less debt, save more and be better prepared for retirement. We may even have avoided much of our current economic plight by not getting as far into debt or by getting into mortgages that we couldn’t afford.